"The doctor was so sweet and quickly diagnosed the problem." "They were fast, courteous and polite. We were very glad they were there." "Attentive, clean, quick, and caring." "Very fast, super friendly and convenient service." "Solid experience, quick and convenient. Good care. I'd recommend!" "The service was fast, friendly and professional." "I was very impressed with the cleanliness, efficiency and kindness of the staff." "This is the very best experience I've had with a walk-in urgent care facility." "Very careful and well spoken. 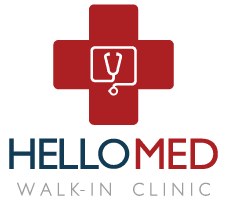 I would highly recommend their care"
HELLOMED is a walk-in medical clinic in Ann Arbor, Michigan that offers urgent and primary medical care for the whole family in a friendly, comfortable atmosphere. This neighborhood medical clinic provides a wide range of services and takes a comprehensive approach to healthcare, looking at the complete health history of each person to make an accurate diagnosis and prompt treatment decision. The dedicated team of physicians provide urgent care for injuries and illnesses, and also offer primary care options for routine wellness exams, vaccinations, pap smears, and specialized physicals for sports and employment. Besides high-quality diagnostics and treatment options, the HELLOMED team provides patient education in a variety of diseases and chronic conditions. Each physician informs those under their care about all aspects of their health and treatment. The medical team follows up with patients to check on the progress of treatment and to monitor their overall health. The friendly staff strives to provide you with minimal wait times for treatment. On-site lab testing is available for your convenience. The clinic even offers Saturday hours and staff speak several languages, including English, Korean, Japanese, and Chinese. Through audio and video over the internet, you can meet with your clinician on-the-go from your desktop, laptop, tablet, or mobile device (iOS or Android) - it’s your choice! Telehealth allows us to connect anywhere with secure and convenient appointments that save you time and hassle. There’s no need to deal with traffic when you can schedule and attend your appointments directly from a laptop or mobile device. At HELLOMED, we accept most major insurance plans. Here is a list of some of the plans we accept. Please contact our office if you do not see your insurance provider listed. No Insurance? No worries. Our Budget Saving Program can help you use affordable and quality health care services. Do you know the difference between the two? The seasonal return of two virus brings a lot of patients to urgent care center. "Extremely friendly and helpful staff, very little wait, clean office, new and up to date equipment. Highly recommended!" "Their facility is clean and modern. The staff was friendly and helpful. The doctor communicated clearly what she was doing and I felt very comfortable asking questions." "I strongly recommend this clinic. It is a great time saver and you are getting a full professional care." "The service was professional, informative and caring. It was very helpful that I could visit the clinic walk-in basis and see a doctor quickly for my urgent problem."